For a brief sweet but never saccharine sojourn to a simpler life and time read this glimpse of a true love story. Coincidentally, a friend recommended this author not long after I had requested an ARC of another one of her books, which was very different in plot and scope from this story. In fact I might not have read this imagining that it wouldn’t be to my taste, I couldn’t have been more wrong. To describe Ms Paton as versatile would be a massive understatement as her writing talents are clearly diverse when considering her body of work so far. A beautiful, bite-sized love story about life, family, the inexorable roll of time and the noisy places in between. Delightfully old fashioned and romantic Tin Kettling tells the story of Kel and Ginty from their introduction at a dance to old age. Reading this story makes one nostalgic for the allure of days gone by. Despite its brevity Tin Kettling touches on many of the social issues of the time that impact us even today. Their son went to America and then Canada to avoid the draft. He stayed for a long time. Partly because it was exciting and partly because being a hairdresser and gay man wasn’t something Ginty accepted. Tin Kettling is only one facet of the varied works of Ainslie Paton, which runs the spectrum from Grease Monkey Jive, a romance featuring a ballroom dance competition to her recent release Detained, which I had the opportunity to read and review. 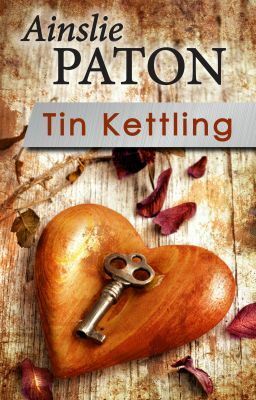 If you are in the market for a respite from the chaos of modern life and wish to sample an uncommonly touching story of a couples life long love Tin Kettling is the read for you.